Your new swimming pool should be your own private sanctuary. It’s where you’ll go to relax and ignore the rest of the world for a little while. So why not take it a step further by adding a feature that epitomizes peace and tranquility? Waterfalls are a surprisingly affordable addition to any home swimming pool installation in Salt Lake City. Even if your in-ground pool has already been installed, you can still get back in touch with the pool contractor to inquire about adding a waterfall. The pleasant sounds of babbling brooks and cascading waterfalls are frequently the stars of musical arrangements intended for meditation. Even if you aren’t interested in meditating, there’s no question that the soothing sounds of your own private waterfall at your swimming pool can help you unwind from the stress of daily life. Your poolside waterfall can be custom designed and built to your exact preferences. It can be as simple or complex as you wish. Some families love the clean lines of sleek, modern design, while others prefer the natural look of rough-hewn stone. If you plan to construct a tall, expansive waterfall of natural stone, you could have the water directed to flow gracefully off multiple levels. Any child who loves to swim will enjoy ducking through a beautiful waterfall—after all, a backyard waterfall far surpasses running through a sprinkler in the backyard. Plus, any pool party your child decides to host will be sure to be a success. Waterfalls are the height of poolside luxury, but they also offer practical benefits. They churn the water continuously, which supports the pool’s filtration system. A waterfall is also an algae deterrent, as algae is more apt to accumulate in still water. Your poolside waterfall can be as unique as your own sense of style. Consider adding some enhancements to it, as well. If you’ve chosen natural stone for your waterfall, you might add a small stone staircase at one side of the waterfall to provide access to a slide on the other side. Add some dwarf shrubs for greenery, or consider adding a fire feature nearby. When you are creating a new landscape design for your property, you may want to talk to a pool contractor in Salt Lake City about the possibility of including a gorgeous water feature in your yard. Water features can be used to accent a special area of your landscape design, and they can also help to highlight a new swimming pool installation. With professional design services from a company that offers swimming pool maintenance and installation, you can create the water feature of your dreams. There are many different types of water features that you can seamlessly integrate into your landscape. A waterfall or trickling stream will provide your landscape design with natural elegance and appeal. If you are seeking a show-stopping element for your property, you may also want to consider installing a dramatic fountain. An outdoor pond can help to create a sense of serenity and calm in your backyard space. Whether you have a swimming pool installation in place or not, there is always room for additional water features in your Salt Lake City landscape. Water features can range from simple ponds to elaborate water walls. You can complement many of these water features with colorful lights, inventive mosaic designs, or natural vegetation. If you have been looking for ways to enhance your overall landscape, then continue reading for a better look at some popular water features. Ponds come in many shapes and sizes and with various features. You may choose a koi pond, filled with colorful and friendly fish. You can also build a garden pond filled with reeds, lily pads, and other aquatic vegetation. One or more ponds can be located throughout your front and backyard landscaping to complement a lush garden theme. There are countless materials to make a fountain, including large urns, pipes, a statue, or a rock sculpture. Fountains can be added to your pond, pool, or as its own water feature. Since there are so many variations, consult your landscaping and pool contractor on the right choice for your landscape design. Water walls and waterfalls are common features for pool installations. You can install a water wall to pour into a beautiful pond or to lead into a babbling brook bordering your property. A water wall can be enhanced with mosaic tiling that features a common or original design of your choosing. Spillways are similar to waterfalls. However, a spillway is technically water that flows out of a dam through different sections. You may have several spillways that flow into your swimming pool or pond from another large swimming pool or pond. 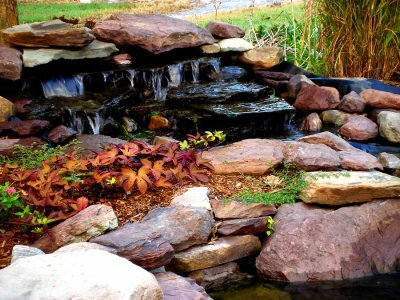 Instead of a pond, you can choose a cascading or flowing river to surround your landscape. Rivers can be filled with aquatic vegetation, waterfalls, fountains, and other popular water features.